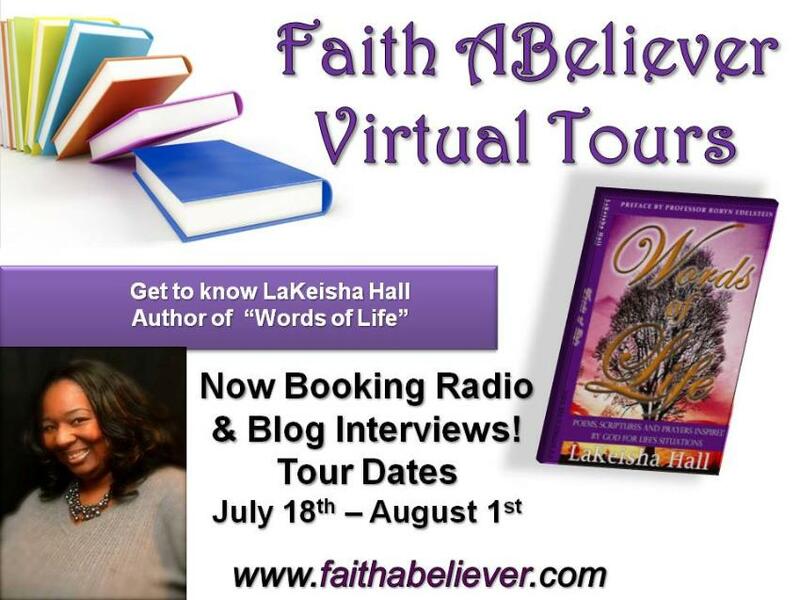 Follow FAB Virtual Tours with Christian Poet Author LaKeisha Hall. Inspirational Poems of Healing and Faith "Words Of Life"
Words of life present an honest, raw and vulnerable insight into the healing process through poetry, scripture and prayer. Each poem provokes you to look within and discover your purpose in life and go after it. Through her own personal journey of loss, betrayal and hopelessness, she has discovered the power of love, peace and forgiveness, and is now revealing how this delicate process can propel you out existing and into living. Inspiring and provoking, this poetic masterpiece exposes how life’s experience affect us spiritually and can be healed through God’s Word, prayer and self-examination. Prepare to laugh, cry, meditate and glean from each page as these gems of wisdom transform your heart and mind one line at a time. Allow the words to shift your mindset and penetrate your heart. Evangelist LaKeisha M. Hall is a Philadelphia, PA native who is loved and regarded by many as a prophetic intercessor; she is a licensed and ordained Evangelist and preaches the gospel with precision, power, and authority. In May 2004 she earned her Bachelor of Science degree in Business Management and will pursue her Master's degree in the near future. She currently resides in Los Angeles, CA where she is an active member of West Angeles Cathedral under the leadership of Bishop Charles E. Blake.